The purpose of our Money Back Guarantee scheme is to give you comfort that you will get a return on your investment, because we are confident that you will should you follow the advice given, adopting some of the key performance improvements that are recommended. Of course, there needs to be fairness on both sides, and all we ask is that you give our service and advice a fair chance of achieving a result. 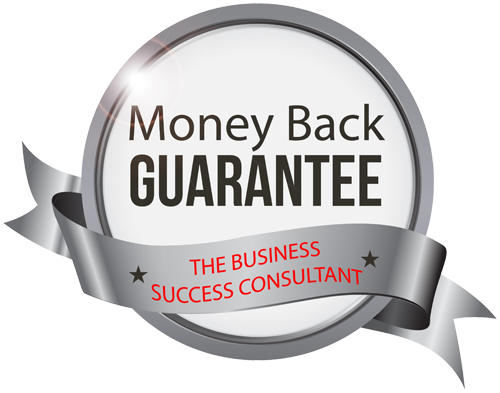 Hence, the Money Back Guarantee applies where we have provided you and/or your Company with bespoke advice, following a business audit and specific report in writing, and six calendar months have passed. If after this period, having implemented at least 50% of the key recommendations, you feel you and your Company have not and will not (were you to implement the remainder of the recommendations) receive value for money you merely have to place your request in writing. This should detail what actions you took in accordance with the report, when and detail the results by comparison to your pre-existing performance. This must be received by us via e-mail or ‘Signed For’ recorded mail within 30 days of the expiry of the six month implementation period. Assuming there is evidence to show that our advice has not resulted in a return on investment we shall refund the fees paid in respect of any relevant ‘Bespoke Services’ without quibble. Please bear in mind our Money Back Guarantee relates only to fees and not any expenses that have been legitimately incurred by us in the performance of our work on your behalf. Such expenses, payable under our contract by you shall not be refunded. Our guarantee also only relates to ‘Bespoke Services’ after a personal visit by us to you. It does not apply to any bespoke advice given remotely, for example by way of telephone communication, where we would be making judgement and giving advice based upon third party assessment or submission. Otherwise, the only conditions that apply to this Money Back Guarantee are that if you are unhappy in any way with our service, advice or systems you tell us so that we can we put things right if necessary for others, but you must not discredit our service, Company or any employee in any way to any third party. In addition, the fees plus any expenses charged must have been paid on time in accordance with the invoices raised. These are our only stipulations, which if breached would result in revocation of our goodwill gesture of your money back. Of course, we are certain that no money back will be required anyway!